Made in California and loved by hair stylists all over the world, Olaplex is the innovative brand that changed the game for hair treatments. This unique and patented chemistry multiplies and cross-links bonds, repairing hair from within, with every application. By utilising the magic of Olaplex, your hair is protected against breakage when colouring or lightening, leaving your locks healthy, shiny and fresh. Olaplex can be used in your salon services, and thanks to the Olaplex Hair Perfector No.3 you can enhance the benefits in the comfort of your own home. 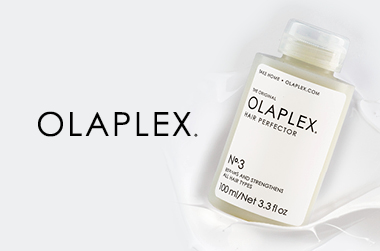 The nourishing Olaplex Hair Perfector No.3 formula uses the same active ingredient as the professional service to guarantee salon grade results. Perfect for those with bleach, coloured, dry or damaged hair, the Olaplex Home Treatment reconnects broken sulphur bonds in the hair to allow for regrowth while revitalising the appearance of hair, helping to enhance colour and vibrancy while eliminating breakage for a smooth and sleek finish. This cult in-salon treatment not only minimises the risk of breakage but also increases elasticity and restores hair to its natural texture and state to improve manageability and help your colour last longer. By using this hair product once a week, your hair will keep that freshly-styled look for longer, keeping your hair immaculate in between salon visits. Think of Olaplex as insurance for your hair. You can now colour and highlight hair without the fear and dread of damaging your hair. Olaplex will strengthen and protect, leaving you with luscious locks. Olaplex is free from silicone, sulphates, phthalates, DEA, aldehydes. Olaplex is never tested on animals. What are the key benefits of Olaplex? Adore Beauty is an official stockist of Olaplex. Buy now and pay later with Afterpay. Adore Beauty offers Free Shipping on all standard Australian orders. My hair dresser recommended I use treatment number 3 in between my olaplex salon treatments. I sleep with it in and so far my hair is feeling and looking fabulous. It looks shiner and healthier and I am already feeling the difference in strength. The treatment left me a tad oily so I’ll be washing my hair on the 3 day instead of the 5th like I normally do but I don’t really mind. The 2 bottles is a great deal!